The aim of research was to evaluate an effect of weather conditions in the years of study considering the air temperature and precipitation as well as granulometric distribution of soil, taking into account the temperature and moisture content, on asymptomatic infection caused by Clavibacter michiganensis subsp. sepedonicus (Cms) in leaves and tubers. The level of infection of leaves and tubers with Cms was differentiated by the thermal and humidity conditions occurring in the years of research. The granulometric distribution of soil (soil profile) had a significant effect on the level of leaf infection. In the year 2014, with moderate temperature and humidity, the highest intensity of leaves and tubers infection was observed on soil of the highest moisture content – sandy loam. In the years with extreme weather conditions, i.e. the drought in 2015 or the abundant rainfall in 2016, the most intensive infection was observed in leaves and tubers grown on soil of low humidity – slightly loamy sand and loamy sand. The degree of infection was found to decrease with increasing air temperature and precipitation level as well as with the increase of soil moisture. On the other hand, increasing soil temperature favoured infection in tubers. El objetivo de esta investigación fue evaluar el efecto de las condiciones meteorológicas en los años de estudio, considerando la temperatura del aire y la precipitación, así como la distribución granulométrica del suelo, tomando en cuenta la temperatura y el contenido de humedad, en la infección asintomática causada por Clavivacter michiganensis subesp. Sepedonicus (Cms) en hojas y tubérculos. El nivel de infección de las hojas y los tubérculos con Cms se diferenció por las condiciones térmicas y de humedad que se presentaron en los años de la investigación. La distribución granulométrica del suelo (perfil del suelo) tuvo un efecto significativo en el nivel de infección foliar. En el año 2014, con moderada temperatura y humedad, la más alta intensidad de infección de hojas y tubérculo se observó en suelo con el contenido de humedad más alto, franco arenoso. En los años con las condiciones meteorológicas extremas, i. e., la sequía en 2015, o la lluvia abundante en 2016, la infección más intensiva se observó en hojas y tubérculos cultivados en suelo de baja humedad, ligeramente areno-arcilloso y areno-arcilloso. El grado de infección se encontró que disminuía con el aumento de la temperatura del aire y el nivel de precipitación, así como con el incremento de humedad del suelo. Por otro lado, al aumentar la temperatura del suelo se favorecía la infección en los tubérculos. Bacteria Clavibacter michiganensis subsp. sepedonicus (Cms) (Spickermann et Kotthoff) Davies et al., is a quarantine organism that causes ring rot of potatoes. The disease is difficult to diagnose and to control because of the pathogen settling the vascular system of tubers, stems and leaves, the symptoms developing slowly or the occurrence of an entirely asymptomatic (latent) form. Latent infection can remain undetected for several years of cultivation, thereby contributing to the spreading of the disease (Slack 1987; Franc 1999; Pastuszewska 2008). The intensity of infection with ring rot depends on the size and type of bacterial inoculum (Nelson 1982; Bishop and Slack 1987), the potato variety (Sletten 1985; Manzer and McKenzie 1988; Nelson and Kozub 1992; Kawchuk et al. 1998) and environmental conditions (Westra and Slack 1994). Variables such as temperature, soil fertility and lighting are known to influence the expression of Cms disease symptoms (Manzer et al. 1987). Although it is certain that changeability of the infection intensity, and mainly the presence of symptoms, depends on the external conditions, the regularity and frequency with which latent infections occur has not been determined precisely. Moreover, the effect of temperature, rainfall or their synergistic action on the degree of infection in potato plants and tubers in changeable field conditions has not been determined. The development of the disease in natural, diverse soil conditions has been explored particularly insufficiently. The granulometric distribution is the basic physical parameter of mineral soils which determines the content of mineral particles of various degree of fragmentation in soil. The content of various granulometric fractions determines the density, porosity, hydrographic, thermal and chemical properties of soil (Ryżak et al. 2009). 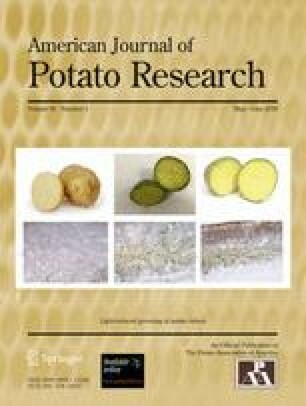 The findings of this research determine the effect of weather conditions in the years of study considering the air temperature and precipitation as well as granulometric distribution of soil, taking into account the temperature and moisture content, on latent infection of potato leaves and tubers with Cms. The field experiments were conducted in 2014–2016 on micro-plots at the Plant Breeding and Acclimatization Institute – National Research Institute, Jadwisin branch (central Poland). Eight potato varieties were used in this study. Cms-free seed tubers were inoculated with the pathogenic Cms strain NCPPB 4053. Inoculum had a concentration of 2.5 × 108 colony forming units in one mililiter of PB buffer (unit x ml-1). Seed tubers were inoculated directly before planting through 1.0 cm deep incisions made in the area of axillary buds with a scalpel covered with bacterial suspension. Cms-free seed tubers, non-inoculated served as a negative control. Tubers were planted in soils diverse in terms of granulometric distribution: slightly loamy sand (I), loamy sand (II) and sandy loam (III) (hereafter called as soil profiles) (Polish Society of Soil Science 2009). Every year, the experiment involved 12 separate micro-plots, each with in area of 5.8m2. Each soil profile consisted of four such micro-plots. 24 potato plants were planted in one micro-plot, at a standard spacing of 33 × 75 cm. In every of these micro-plots were planted all eight potato varieties - three tubers of one variety in each micro-plot. Tubers inoculated and healthy (non inoculated) were planted in the separate micro-plots. Tubers inoculated with a bacterial suspension were planted in the three micro-plots of each profile. Non inoculated tubers were planted in the fourth micro-plot of each profile. A total 9 inoculated tubers and 3 non inoculated tubers of one potato variety were planted in the one soil profile. The arrangement of the varieties in the micro-plots was casual, but always three tubers of one variety were planted side by side. From the beginning of May to the end of August, three times a week at one of the micro-plots of each soil profile the temperature and humidity was read. Approximately 50 data reading of the temperature and humidity were collected of one soil profile each year. Soil temperature was measured at a depth of 10 cm with a mercury thermometer; soil water content was measured at 20 cm using a ECH2O Dialectric Aquameter sensor and a ProCheck Decagon Devieces reader. Tubers were planted in the first week of May. The soil was amended with 100 kg N ha−1, 80 kg P2O5 ha−1 and 140 kg K2O ha−1. Herbicide, fungicide and insecticide treatments were applied twice during the growing season. In order to identify Cms bacteria with a test of indirect immunofluorescence (IFAS), samples were taken from potato leaves after the flowering of potato plants and samples from progeny tubers after the harvest. Every plant was tested separately. This means that from the plants of one potato variety growing on one soil profile, 12 samples were taken (9 from inoculated plants and 3 from control plants). In one year, 288 leaves samples were taken and the same number of progeny tubers. One sample consisted of two healthy leaves from lower levels of each stem of one plant. A sterile scalpel was used to cut up ca. 2.0 cm fragments of leaf stalks into 0.5 cm pieces. On average, the plants had 4 stems. In one sample, there were about 30 pieces of leaf stalks. In case of tubers, all the healthy tubers of one plant were one sample for the IFAS test. In one sample, there were from 3 to 19 pieces of tubers. Rotten tubers and ones with suspected symptoms of infection with Cms were discarded and were not tested because the research focused on latent infection. Rotten tubers accounted for about 7% of all tubers, while tubers with typical symptoms of Cms 0.5%. A sterile scalpel was used to remove the peel from the part near the stolon and conical samples of the vascular tissue of tubers were cut out. Sections of leaves or tubers were placed in 30-ml plastic containers and covered with 5 ml of 0.05 mol/1 of phosphate buffer for maceration (pH 7.0). Then they were agitated on a shaker for four hours at 120 rpm. Next, the suspension was centrifuged for 10 min in a refrigerated centrifuge (4 °C) at 10,000 rpm. The supernatant was discarded and the pellet was suspended in 1 ml of 0.01 m/1 phosphate buffer (pH 7.2). The pellet and its three decimal dilutions (10−1, 10−2, 10−3) were spread on multiwall microscope slides. Subsequent actions with the samples were carried out in accordance with the IFAS test procedure specified in Annex I to Commission Directive 2006/56/EC of 12 June 2006 on the control of potato ring rot. Polyclonal antibodies were used for testing (Loewe Biochemica GmbH, goat antibodies) as well as conjugate (Loewe Biochemica GmbH, rabbit antibodies -Cy3). Slides were observed at magnification of 630× under a microscope (Carl Zeiss Jenalumar) equipped with an UV lamp and filter set for fluorescein. Typical fluorescing cells were counted in 20 microscope fields. The results of IFAS tests were used to determine the degree of a latent infection of leaves and progeny tubers in a sample on a 0–9 scale, where “0” denotes the absence of any Cms cells, and “9” – an average count of more than 500 Cms cells within a field of vision of a microscopic preparation (Table 1). The results are expressed in degrees of infection. The dependent variables were degree of a latent infection of leaves and tubers in each sample origin from the seeds tubers inoculated with a bacterial suspension. The independent variables (experimental factors) were: weather conditions in the years of study, soil profiles and potato variety. STATISTICA 12 ANOVA programme was used for statistical analysis. Tukey’s test (P < 0.05) was used to verify the significance of differences. Spearman correlation coefficients were calculated to show the relations between air temperature, total rainfall, soil temperature, soil moisture content and Cms infection of leaves and tubers at P < 0.01 and P < 0.05. The analysis of variance and Spearman correlation coefficients involved 648 variables. As for calculate the Spearman correlation coefficients the air temperature and total rainfall factors at a given year were the same for each variable. Air temperature in the growing season of potato during the study period was elevated – on average by 1.5 °C – exceeding the multi-year average. Differences in air temperature of research years were insignificant. The average air temperature in 2014 was 15.8 °C, 16.0 °C in 2015 and 16.1 °C in 2016. Shortage of rainfall was recorded during the 2014 and 2015 growing seasons. The total rainfall in the first year of the study was lower than the multi-year average by 68.2 mm, and by as much as 164.5 mm in the following year. The rainfall in 2016 was above the ordinary level (Table 2). The weather during the study period affected the conditions in individual soils (Table 3). The highest mean temperature in the potato growing season was recorded in loamy sand (II profile), but it was higher only by 0.1 °C than the soil temperature in the other two profiles. Sandy soils (I and II profiles) were warmer in the initial part of the potato growing season than the loamy soils; however, they were cooler at the end of the growing season. The soils were diverse in terms of moisture content. The highest monthly average volumetric water content in soil was recorded in sandy loam (III). The lowest moisture content was found in slightly loamy sand (I). There was an average 15% difference in the moisture content between these two types of soil. All IFAS tests coming from the controls gave a negative result. As for the inoculated plants, the IFAS test of leaf and tuber tissues confirmed the presence of Cms bacteria in majority of the samples (Table 4). The largest percentage of Cms-free samples was found in 2016. Whereas, bacteria cells were found in all of the samples in 2014, except those from plants grown on loamy sand (II). Plants grown on loamy sand (II) provided leaf samples with the highest percentage of negative results – 17.4%, but at the same time with the lowest percentage of Cms-free samples taken from tubers – 7.4%. The average degree of leaf infection was 3.7 and it was nearly twice lower than the average degree of tuber infection - 6.3 (Table 5). These findings are inconsistent with those of Kaemmerer et al. (2007). They demonstrated that the intensity of infection in leaves and tubers was similar, and even much higher in leaves in the initial part of the growing season. The significant effect of the weather conditions during the study period and the soil profile on the level of Cms leaf infection was observed. Whereas, the degree of tuber infection was significantly affected by weather conditions in the years of study. No significant effect of the soil profile on tuber infection with Cms was observed. The significantly lowest degree of leaf infection – 3.1 – was recorded on loamy sand (II), and the highest – 4.3 – on sandy loam (III). It seems that the highest average degree of leaf infection in the plants grown on sandy loam was a result of a relatively high degree of leaf infection observed on this soil only in 2014. In the other two years, a higher degree of infection was recorded in leaves of the plants grown on sandy soils of I and II soil profile. A similar relationship, although not confirmed statistically, was observed in tuber infections. The lowest degree of leaves and tubers infection was observed in 2016, in which the total rainfall was very high – above the average level. Significant differences in the infections was observed only in tuber infection in dry years of 2014 and 2015. Tubers grown out of the plants cultivated in 2014 – when the rainfall shortage was much smaller than in 2015 – were more strongly infected. As has been said above, the significantly highest infection of leaves and tubers was observed in 2014 on loamy soil (III) and the lowest – on the same soil in 2016. The results indicate that loamy, moist soil created favourable conditions to infection in moderately dry and warm conditions in 2014, but it was disadvantageous to Cms growth in plants and tubers when there was too much rain in 2016 or too little of it in 2015. The same relationship was observed with tuber infection on slightly loamy sand. The dry and hot weather of 2015 had a stimulating effect on the pathogen growth in leaves of plants grown on sandy soils. The results indicate that increased moisture content in soil and a high total rainfall in the growing season had an adverse effect on Cms growth in leaves and tubers are confirmed by statistically significant, negative correlation coefficients for these variables (Table 6). The degree of infection of potato leaves and tubers was also shown to decrease with increasing air temperature. On the other hand, the Cms cell count in samples taken from tubers increased with increasing soil temperature. However, the relationships were very weak. The highest correlation coefficient was −0.213. These findings are largely consistent with literature data. The optimum temperature for Cms growth is about 20-23 °C; however, disease symptoms, which result from large numbers of the pathogen cells in plant tissues, develop faster at higher air temperatures (Van der Wolf et al. 2005; Eddins 1939; Bishop and Slack 1982). Logsdon (1967) showed an elevated soil temperature to favor development of infections. He planted tubers inoculated with Cms to soil at constant temperatures of 16 °C, 19 °C, 21 °C, 25 °C, 28 °C, 31 °C and 34 °C. He recorded the largest number of symptoms and their earliest onset in plants growing in soil at 25 °C. He found the highest percentage of infected plants and tubers, as assessed by Gram staining 52 days after planting, among those growing in soil at temperatures of 25 °C and 28 °C. A similar relationship was observed earlier by Dykstra (1942). In his study, planting tubers infected with Cms to soil at a higher temperature resulted in high activity of bacteria, with consequent earlier and stronger symptoms of infection on plants. There are contradicting data on an effect of humidity on development of the disease. According to some sources, excess of water inhibits the symptoms appearance (Pastuszewska 2002), others provide examples of stronger infection of potato when fields were irrigated intensively (Dykstra 1941). In studies conducted by Hukkanen et al. (2005), in which the IFAS test was used to determine the count of Cms in samples, more bacteria cells were found in leaves and tubers in dry years, regardless of the location, like in this study. However, these authors did not analyze in detail the effect of weather or soil conditions on infection with ring rot. The level of infection of leaves and tubers with Cms was also differentiated by the potato variety. The potato varieties grown in this study differed in regard to their sensitivity to artificial inoculation with Cms, and the degree of their infection varied in regard to the years of study and soil profiles (Fig. 1a, b). Greater diversity in regard to infection of leaves and tubers was observed in different years of study in majority of the varieties than depending on the soil profile. A high degree of infection of leaves and tubers, as described above, which was observed in 2014 on sandy soil, was noted in half of the varieties under study: Bosman, Gwiazda, Jurek and Sagitta. Notably, tubers of the Bosman and Gwiazda varieties were infected in the highest degree in 2014, regardless of the soil profile. In studies conducted by Westra and Slack (1994), Kawchuk et al. (1998) and Hukkanen et al. (2005), it was also found that tubers of some varieties, infected artificially and treated in the same manner, can behave differently depending on the place where they are grown or on the year of the study, i.e. in various weather and soil conditions. However, these authors did not analyze in detail the effect of weather and soil conditions on infection with ring rot. Based on the analysis of variance, it was found that the highest impact on leaves and tubers infection had potato variety: F value of 29.713 and 18.706, respectively. Subsequently, the level of infection of leaves and tubers was largely dependent on the weather conditions during the years of the study. The conditions of the soil profile had only an average effect on the level of leaves infection. In addition, the interaction of the weather conditions in the years of study and potato variety on the degree of infection with Cms was proven. The interaction of the weather conditions in the years of study and soil profile on the degree of infection also was proven (Table 7). These results are an original attempt at determination of the effect of weather conditions during the years of the study and soil conditions on the profile on intensity of asymptomatic infection of potato leaves and tubers by Cms. This study is a new element in epidemiology of Cms. It has been shown that the level of infection with Cms depended on the potato variety but also depended on the weather in a year and granulometric composition of soils and their conditions. In general, the level of infection was found to be lower when humidity was high. Growing potatoes on light soils with the granulometric composition of slightly loamy sand (I), of the lowest moisture content, favoured multiplication of Cms in leaves and tubers. There was an exception of 2014, when the temperature- and moisture-related conditions in the growing season were moderate. It is curious why, in this particular year, the highest degree of infection occurred in sandy loam soil (III) – the most moist substrate. These results turns out that identification and characterisation of individual external factors that affect the growth of Cms populations in a plant is very difficult, and it seems to be practically impossible to determine the effect which results from the interaction of these factors. Determination of such relationships requires many years of observations. This research must be continued, also because of the still topical issue of control of Cms in the environment. This research was supported by the Ministry of Agriculture and Rural Development, Poland.